Following hot on the heels of yesterday’s super moon today we have Venus trining Mars… a planetary aspect wonderful for love and in this instance as the two planets are in Air signs… love is all about communication. The Ten of Cups is all about happiness and as can be seen from the image on this card nothing is going to ruffle your feathers today. You have your two feet planted firmly on the ground or as can be seen from this image you have your feet well and truly planted within the ground as if you are so in touch with yourself and what you want that nothing will shake you from your goals. Ten cups lay in front of you as if they are floating on clouds which is another indication of today’s transits with Mars and Venus trining in air signs (clouds). However, the other interesting astrological aspect that occurs today is Mercury re entering Cancer after a few weeks of retrograde movement and will soon come to pass over the degree of Cancer it first went retrograde at. Problems you may have experienced the last few weeks are coming to an end. It’s time for you to slow down any thoughts which have been racing through your mind so quickly that you can’t catch hold of them. Time to become more grounded in what you are really wishing for and realise that it is within your reach. You have the resources and more importantly… the wishes… to attain your goals. You may wish to think of what is in those cups or if you consider them empty what you would like to fill them with. Remember today is all about happiness… and to be more specific… your own happiness. Wish big and fill those cups to the brim or to overflowing there’s plenty to go around today. 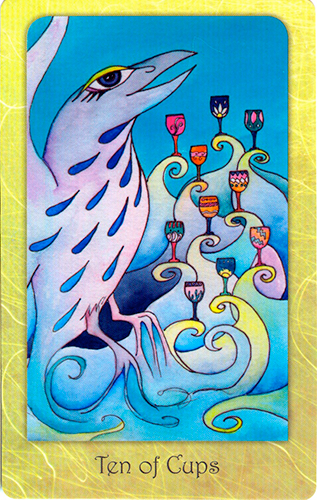 The card used for today’s tarotscope — Ten of Cups — is part of the Dream Raven Tarot collection, designed and created by Beth Seilonen, published by Schiffer Publishing. Used by generous permission. These beautiful cards can also be found at her Etsy storefront. Please visit and “like” her Facebook Fan page! Previous Post: Ask the Tarot: Is That all There Is?